How we got started. Experience counts! Fortress Fencing, LLC began from a friend’s referral in October 2001. What began as a small, two person operation has now grown into the most reputable brand name in fence for the triangle area. Locally owned and operated, Fortress enjoys the benefits and recognition of a large business with the personal touch of a small company. As our company has grown, the expertise of our work force has resulted in consistent construction across the board. Each builder has been trained with the tools needed for quality construction. Fortress Fencing, LLC offers the highest quality fence construction backed by a strong warranty, unsurpassed service, and superior workmanship. We take pride in creating the picture perfect fence. 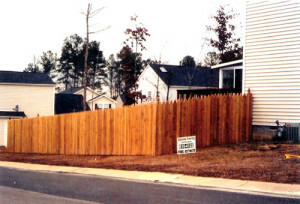 The photo to the right is Fortress Fencing, LLC’s first fence, built in Durham, NC in October 2001. No matter residential, commercial, or industrial, Fortress Fencing, LLC offers a wide variety of fence styles to meet every need and budget. From custom wood fences, vinyl fences, aluminum fences, and chain link fences, we have exactly what you need to make your project complete! When it comes to quality, our fences speak for themselves. When it comes to excellent customer service, our thousands of satisfied customers speak for themselves! There is NO DOUBT that Fortress builds the sturdiest fence! Thank you for your superb job with our fence! Our dog Ted especially loves it!